Provided that one has indexed the references effectively, the process is simple and very time-saving. When one considers the time that has to be put into the production of reading lists, this new feature is certainly a blessing! 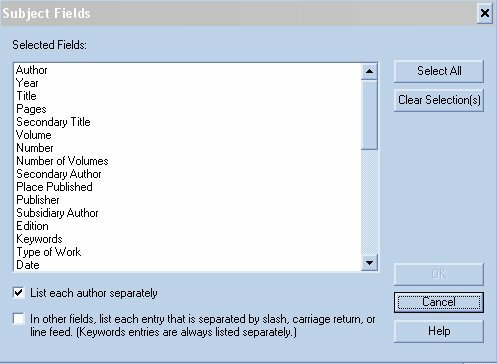 EndNote's 'Cite While You Write' feature works with Microsoft Word and, through an add-in program, with WordPerfect. Version 7.0 introduces a new capability to scan .rtf files produced by virtually any word processor, including OpenOffice, Star Office, AppleWorks and Microsoft Works. Virtually the full capability of EndNote is thereby made available to practically everyone. Version 6.0 introduced support for diagrams and figures and Version 7.0 increases the functionality in this respect by distinguishing between figures and tables and allowing the maintenance of separate lists of these features. The layout can also be manipulated to allow, for example, the positioning of the figure or table title. [For anyone preparing a manuscript for Information Research remember to put the title below the object. Items in the file that include a picture of any kind are identified with a paperclip icon. Another new, useful feature will probably please a great many people: this is the ability to work with the PalmTM PDA. 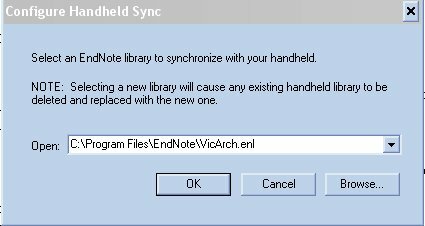 If you already use Palm Desktop, the EndNote add-in will be installed when you install the main program. One then simply uses Palm's 'HotSync' function and the file is transferred to the Palm - only one file at a time can be transferred in this way. The file of 464 records occupies 251Kb on the Palm. The records can be sorted by Author, Year or Title and the Palm's search function can be used to search for individual recors. The sorting is rather slow, but the search function is pretty fast. The screen shots below do not relate to the file I used, but were provided by ISI ResearchSoft: however, they give a good indication of the appearance of the file and of the functions that can be use. The second picture shows the form for a new reference and, of course, the file can be amended while it is on the Palm and those changes will be synchronised with the EndNote file when the two machines are next synchonised. You can see what is going on here: the system locates the resource in its own catalogue and pulls out the information it has. The links given are demo links only, except for the Find title link, which takes you to the top page of the journal, and the Google search link. As it happens, if you click on the latter, you will find that eight of the first ten links concern this item and the first takes you directly to the paper. I created a record for the Caplan and Arms paper and then went through the same process for that - again, the Google link provided the fastest route to the paper. Find title only leads to the current issue, the A Union Catalog leads to a search page for the Worcester Area Union List Of Serials, while the (An Innopac) Union List of Serials link is a dead link. The An Endeavor Catalog link leads to the results of a search of the Clark University Online Library System for the surname Caplan. In reality, of course, it would have been sensible for me to click on the URL in my EndNote record - that would have taken me directly to the paper, but that can only happen with open-access resources, and this new capability of EndNote will be very useful for those whose institutions have bought into the OpenURL idea. Provided, of course, that you record the URL for an electronic journal. A further development noted is that EndNote references can be imported into data visualization tools and I assume that this is the result of the development of RefViz, ISI ResearchSoft's own visualization program. Fortunately, I received a review copy of RefViz in time to take account of it in this review. RefViz can be used to analyse sets of references downloaded from some of the standard bibliographic databases, such as Web of Knowledge, BIOSIS, CAB Abstracts, INSPEC, and MEDLINE or with EndNote 'libraries' - or reference files. The first thing to note is that RefViz will be of little help to you if you do not put abstracts into your EndNote file. As the online documentation says, without abstracts there is insufficient data for visualization to work. As I rarely put abstracts into the file (although I shall do so from now on! 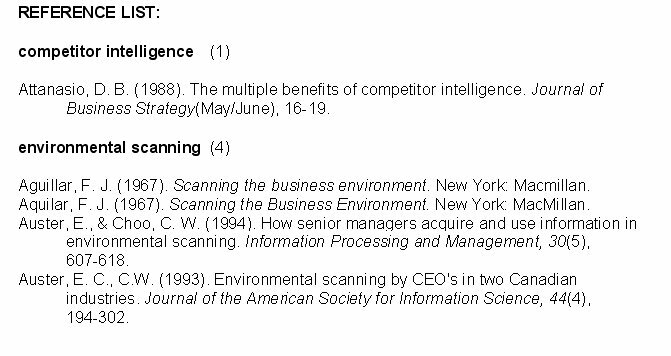 ), I searched Web of Science for papers on 'information overload' and downloaded a file of 248 references. The picture is more or less self-explanatory: the pane in the top left shows the visualization of the file in 'galaxy' mode - the small document icons identify the groups created by the software, while the small squares indicate individual documents. Below the 'galaxy' pane is the Reference Viewer, which shows selected details of the selected group, or document. Click on any reference and the full record pops up in a new pane. The panes at the top right show the keywords selected to create the groups - it looks as though the common words, such as technology, system, and research, are not selected, nor are the words used to compile the file, information and overload. The keywords, therefore, give a good clue as to how the documents come to group together. Thus, the commonest, primary keywords in the Group 1 documents are change, service, development, process, and user, which suggest as group of documents related through dealing with information overload arising out of organizational change processes. By contrast, when we highlight Group 6, the commonest keywords are, user, search, internet, web, technique, access, tool, service, and structure, which certainly looks non-overlapping with Group 1. Thus, VizRef enables the scholar quickly to identify groups of documents from larger files that may be of interest and, if the overlap between groups appears to be small or non-existent, can be relatively assured that the group is homogeneous. One might select this field for the Reference Viewer to discover to what extent one's topic is represented in a few key journals. The bottom right pane is the Advisor, in other words, a constantly present help service. The pane illustrated gives information about the Galaxy view, with links to additional information in the help system. All of the panes can be adjusted for size and, for a densely populated Galaxy, it is useful a) to increase the window to full-screen size and then enlarge the Galaxy pane. Perhaps because of the nature of the topic, or the relatively small size of the file, I found this less immediately useful than the Galaxy view. Along the top of the pane are the keywords, and down the size, the groups. The colours represent intensity of similarity, in this case - the redder a square, the stronger the association. The drop down menus at the bottom of the pane, reading Color by, Order, and Rows can be used to change the character of the presentation. Instead of, respectively, Relevance, Similarity and Groups one can choose a presentation that shows Counts, Alphabetical and Keywords. There is an emerging concern that modem glass cockpits induce information overload. This is sometimes thought to be an inevitable result of the increased complexity and the need for automation that accompanies the transition to high technology. We argue here that the human performance problems created by glass cockpits are not an inevitable consequence of increased hardware complexity or of automation but, instead, are a result of nonfunctional design that increases complexity at the cockpit interface. Not, perhaps, absolutely central to my interest in overload, but an interestingly support for my view that producing ever more complex interfaces in order to develop systems to reduce overload, is going in the wrong direction. Similarly, I would not normally think of looking at Auditing - a Journal of Theory and Practice, but the abstract reveals that: "Information overload, satisfaction with supervision, and accuracy of information were less in audit teams with greater structure. ", and this is certainly directly relevant to my interests. I approached VizRef with a certain degree of scepticism, never having been convinced of the value of visualization, but I have been won over. Developments in EndNote take place with surprising rapidity: a new version appears just about every year. On most occasions the new features or amendments are minor, but in the case of EndNote 7 the two major changes of PDA compatibility and visualization make it worth upgrading. Of course, VizRef is a separate package, rather than a module within EndNote, but perhaps their integration into a single package will come along a little further down the line.